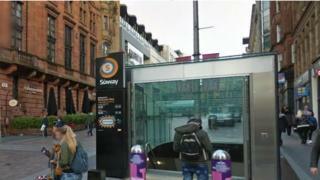 A man has been arrested after a passenger was pushed on to rail tracks at a Glasgow Subway station. The 30-year-old man, from Doune in Stirling, has been charged with assault and culpable and reckless conduct. He will appear at Glasgow Sheriff Court on 12 January. The incident in which a 23-year-old man was knocked on to the tracks happened at Buchanan Street station on Saturday. Police said the victim managed to pull himself back on to the platform. He was then punched after climbing back on to the platform. British Transport Police thanked the public for their help following an earlier appeal for information.